Looking for a management training seminar to optimize your supervisor skills, leadership qualities, and performance? Then, you’re in the right place. In this unique supervisor skills seminar, you learn how to consistently to be your best, optimize your supervisor skills, and bring out the best from your team. We can’t function at your peak when we think in suboptimal terms. During the seminar, you will obtain best practices to inspire others to commit to an optimized mission and make the most constructive decisions in any situation. You will define what ‘the best’ means to you and your organization. Using your unique leadership qualities, you will deploy optimum leadership skills and strategies to achieve what is most important. And you will confidently resolve conflicts and determine solutions that maximize talents, resources, opportunities and profits — top down, bottom up! initiate five simple steps to transform a typical workplace into an optimized workplace! People in any type of organization who are interested in optimizing their supervisory skills. One-on-one executive coaching is best used to maximize management and leadership skills development, optimize behaviors, and resolve personal/psychological/cultural issues that inhibit peak performance. We provide coaching in a customized stand alone format or to follow up specific aspects of this seminar. We also work with new executives in organizations to optimize their assimilation into the organization. Our executive coaching provides assessment, feedback and action planning to optimize the supervisor’s skills and competency to lead the organization. Executive satisfaction and retention can be maximized. Our coaching supports a strategic optimized organizational future by formally supporting executives and optimizing their personal and professional lives. We help supervisors to assess their leadership qualities / current competencies, clarify expectations for future performance, set and prioritize goals, plan for continuing optimization, and execute for maximum effectiveness. We provide executive coaching, via video conference or office visits at your convenience. Monday to Friday, 8:30 am – 5:00 pm PT. Thank you for the super job. The evaluations are coming in with top scores. The members enjoyed hearing you share your ideas and super success stories. You really had them motivated! Thank you for the interesting and stimulating presentation on Optimal Thinking. There was an enthusiastic response to your material. Participating in your Optimal Thinking seminar was the best day of my life. I am making the most money ever, my relationship with my family is the best ever, and I am enjoying life to the fullest. I owe it all to Optimal Thinking. Dr. Glickman, you are a genius! There is no limit on what you can achieve if you optimize and utilize optimal thinking in your day-to-day activities. Rosalene Glickman is a vibrant excellent communicator, a thought leader who is committed, dedicated and caring. She didn't waste time or get bogged down. The seminar showed me it's all up to me and I CAN optimize. An optimal experience. Thank you for your excellent presentation at this year's 2007 SEMA Show in Las Vegas. Thank you for all your hard work. I look forward to working with you again in the future. 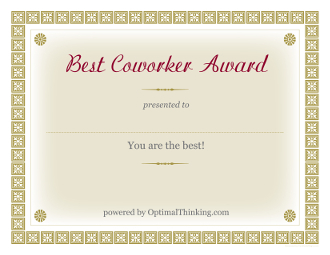 Our gift to help you create your own best place to work.